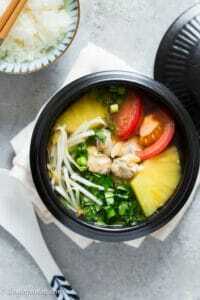 Vietnamese Sweet and Sour Clam Soup (Canh ngao chua) is light in body. 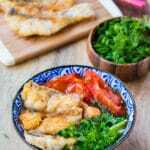 However, it is full of sophisticated flavors while being so quick and easy to make. 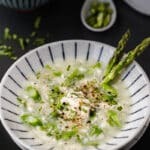 I once explained in my Crab Asparagus Soup post that there are two types of soup in Vietnamese cuisine. The first one, called “sup”, shares many similarities with Western soups. 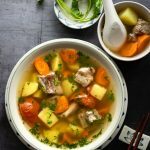 The second one, called “canh”, has a thin and watery consistency and is usually a dish in our daily meals. This sweet and sour clam soup falls into the latter category of Vietnamese soups. This soup has a complex and interesting flavor profile. Contrasting flavors co-exist in harmony and complement each other in Vietnamese sweet and sour clam soup. The pineapple and tomato in this soup give it the subtle sourness and sweetness. The clams create a bright, slightly salty and sweet broth with somewhat a mineral-like taste. Bean sprouts deliver a crisp and fresh bite to the soup. Not only does the soup taste good, but the aroma from it is also hard to resist. You can smell the scent of the ocean brought by the clams and the sweet and tropical scent of the pineapple. Lastly, the herbs make the soup smell even more incredible. I love pouring this sweet and sour clam soup over cooked rice. I think serving it with a meaty or salty main dish will balance the meal, making it more palatable. 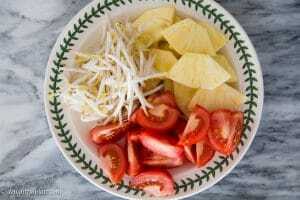 The ingredients you need are clams, pineapple, tomatoes, bean sprouts, and herbs. I like using littleneck clams or clams with similar size for this dish. If you can’t find fresh clams, using bottled clam juice and frozen/canned clam meat may also work. However, I haven’t tried taking that route. I did use a combination of fresh clams and frozen clam meat since I wanted more clam meat in my soup and fresh clam costs me $1/each where I live. You should choose near-ripe or just ripe pineapple. After being cooked, the pineapple will be so sweet, soft and juicy. 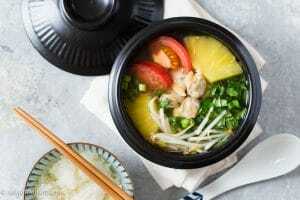 The best herbs for this soup are Vietnamese coriander and scallion. 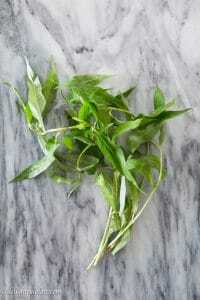 Vietnamese coriander (rau ram) also goes by laksa leaf. Its aroma is stronger than cilantro and it also has a spicy and lemony note. You can check your Asian grocery stores for this herb. If it is not available, you can substitute with dill though their scents are quite different. 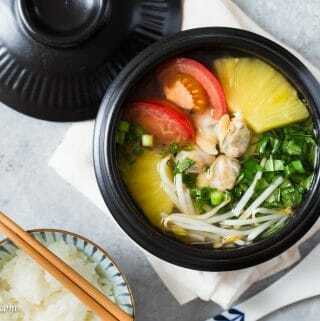 Cooking Vietnamese sweet and sour clam soup is quick and straightforward. First of all, you need to scrub the clams and submerge them in salt water to purge sand from them. After that, you cook them in boiling water until the shells are open. You can then add tomatoes, pineapple and fish sauce to flavor the broth. Those are all the easy steps you need to know to cook this tasty clam soup. Scrub clams under running water. Place in a bowl, cover with water and add salt generously to the water. Set aside to purge clams for about 20 minutes. If clams are too dirty, repeat this process. After that, give them a quick rinse. 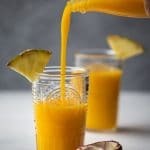 Slice pineapple into 1/3 inch thick slices. Cut tomatoes into wedges. Thinly slice scallion and roughly chop Vietnamese coriander. Bring 2 1/2 cups of water to a boil in a pot over medium high heat. Add clams, cover the pot. 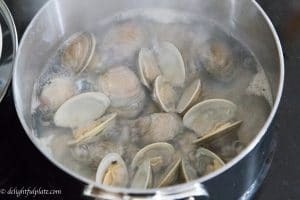 When the shells are open, remove clams immediately from the pot. Skim off foam from the cooking liquid if there's any. Remove the pot from the heat. Let all the impurities sink to the bottom of the pot. Carefully pour the cooking liquid into another clean pot without pouring the impurities. When you find it impossible to continue pouring without letting the impurities poured in, discard the remaining liquid. Place the new pot with clear cooking liquid on the stove and bring to boil. Add pineapple and tomatoes, reduce heat to a simmer and cover and cook. Meanwhile, pick the clam meat from the shells, set aside. When tomatoes are softened and you start to smell the pineapple scent, about 5 minutes or so, turn up the heat and when it starts to boil, add fish sauce and bean sprouts. Stir and when it starts boiling again, add clam meat and herbs. Adjust seasoning to taste, then transfer to serving bowls and serve hot. Use littleneck clams or clams of similar size. If you want more concentrated soup, use more fresh clams. If you want more clam meat in the soup, you can add 1-2 oz frozen clam meat right after adding the bean sprouts. You may try using bottled clam juice and frozen/canned clam meat instead of fresh clams. I haven't tried this so I'm not sure if the quality of the soup would be the same.